Since being demoted for the first time in 2011 to make room for J.C. Romero, David Herndon has not allowed an earned run and has an 8 to 1 strikeout to walk ratio. Herndon, who has been used primarily in mop-up situations, was optioned to regain command of his slider, according to David Hale of Delaware Online’s interview with Phils’ pitching coach Rich Dubee. In his first 11 appearances of 2011 before his initial demotion, Herndon gave up 14 hits, walked 7, gave up 3 home runs, and only struck out in 10.2 innings pitched. Since returning, Herndon has struck out 8, has walked none while hitting one batter, while posting a .200 BAA, lowering his ERA from 9.28 to 4.57 in 11 innings pitched across 7 appearances. Herndon’s improvement could be due to any number of factors: line-ups faced, a regression to the mean, role (mop-up or high pressure), or small sample size. As you can see, Herndon has fared well since his return in a very small sample size against teams that are currently in the playoff picture, particularly after his first demotion. Herndon’s tough game against Milwaukee continues to haunt his overall ERA; if you remove the 3 ER from that game, he would currently have a 3.40 ERA rather than a 4.57 ERA, which, if anything, speaks to the small sample size. Herndon’s next two worst performances (2 ER on 2 H against the Astros and 3 ER on 2 H, 1 BB, and 2 HR against the Mets) came before his demotion and were against teams struggling to compete. Herndon’s success hasn’t necessarily been based on which line-ups he is facing. As a Rule 5 Draft Choice in 2010, the Phillies were required to maintain Herndon on their 25-man roster for the entire year or they would have to offer his rights back to his original team, the Los Angeles Angels. Prior to 2010, the highest level Herndon reached was Double A, but had a reputation for being a ground ball-inducing sinker-baller who relied on the pitch to get ground-ball outs. Herndon does not make batters swing and miss, as indicated by his 8% swinging strike percentage, 5% before his first demotion and a much improved 11% after. The 8% swinging strike percentage directly matches his total from 2010. This one you can throw out right away, mostly due to incredibly small sample sizes. However, if you didn’t throw it out right away, you’ll see that Herndon was equally effective and ineffective in both high and low pressure situations in his first round with the Phillies while he has been pretty effective since his first demotion in both scenarios. This is the likely culprit and goes hand in hand with the regression to the mean theory. Herndon skipped Triple A to reach the Majors in 2010 and only pitched 52.1 innings in 47 games, which is relatively small sample size for a reliever in itself. 2009 was his first full season as a reliever and he pitched in 65.1 innings across 50 games for the Arkansas Travelers in Double A, compiling an effective 3.03 ERA, but allowing 1.9 BB/9 IP, 1.2 HR/9 IP, while only picking up 4.8 K/9 IP. While at Triple A Lehigh Valley in 2011, Herndon has put up impressive 1.2 BB/ 9 IP, 8.6 K/9 IP and a 7.0 K/BB ratio across 14.2 innings.These are all small sample sizes but indicate some measure of success. David Herndon has been unquestionably significantly more effective since his first demotion on May 4, 2011. 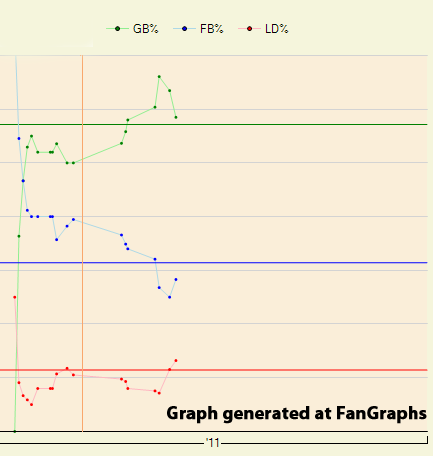 By inducing more ground balls, Herndon plays to his strengths and his seen his ERA cut in half and his WHIP sink. His BABIP becomes very important as he pitches to contact. At .275, he currently sits below the league average and has gotten a little luckier than his .357 BABIP of 2010. The key for Herndon maintaining the improvement are two things any Major League pitcher should strive for: continue to limit his walks and keep opposing hitters in the ballpark. As the sample size gets bigger, we will be able to tell if Herndon, at age 26 with many years left in his arm, will be a cog in the Phillies bullpen for the next few seasons.